Winter doesn’t scream salad because a) nothing locally is in season here in New England b) it isn’t warm & comforting like winter food and c) aren’t we wearing chunky knit sweaters for a reason? However, hitting a bunch of food groups in one dish makes me feel accomplished and there’s nothing more grown up for my lunch than arugula salad – compared to eating the crust of somebody’s pb & fluff sandwich while doing something else. This is a home lunch, or a dinner! I do not condone warming fish at the office. Nope. 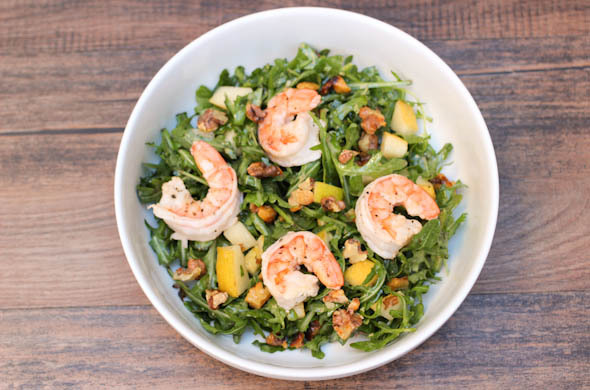 I bring you this salad with juicy shrimp, peppery arugula and pear to inch us towards the local produce that will be, once the seasons change and because we all deserve a restaurant-quality salad at home. 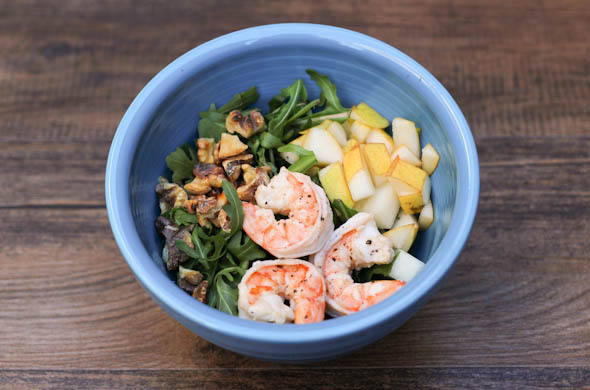 Veg, fruit, nuts, and fish -all in one dish? Yesss! Plus, my dressing hack takes zero brainpower and is ohh-so-perfect! In a completely dry pan, toast the walnuts over medium-low heat, being careful not to let them burn – about 3-5 minutes. Peal & de-vein the shrimp. Then heat a small pan to medium heat with the butter. Sear the shrimp for about 2 minutes on each side until pink and just cooked through. Remove promptly from the heat and set to the side. 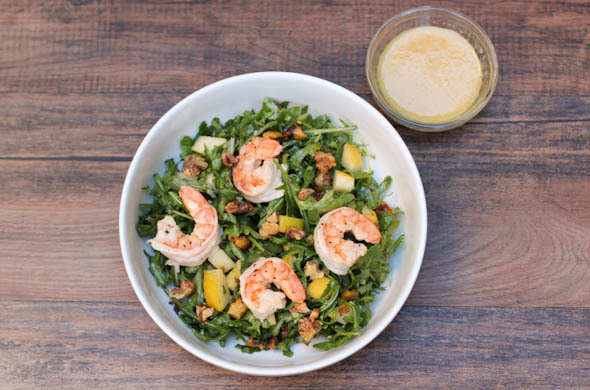 Mix together the arugula, toasted walnuts, pear and shrimp. 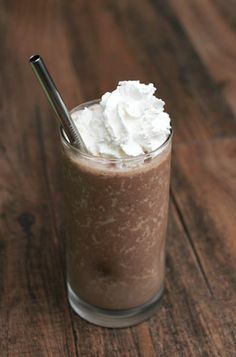 In a small jar (or in a bowl with a whisk) shake together the two dressings. Toss the salad in the dressing. I love the sweet pear with the peppery arugula. 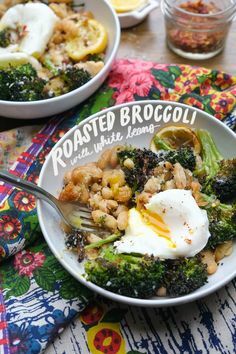 There is such great flavor here without becoming super complicated- which is how I normally like salads = all.the.stuff. The dressing is spot-on and would be that dressing at a restaurant you love that you can’t put your finger on what exactly it is. The Italian dressing decreases the sweetness of the honey mustard. The best Italian is this one – seriously, so perfect.